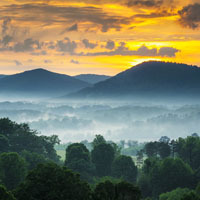 There are plenty of seasons and plenty of reasons to explore Blairsville and Union County, Georgia, deep in the heart of the Chattahoochee National Forest and North Georgia's Blue Ridge Mountains. Here, you'll enjoy hiking, mountain biking and horseback riding, as well as watersports on two lakes: Winfield Scott and Nottely. South of Blairsville, the county seat, adventurers can explore eight wonderful waterfalls, as well as petroglyphs left by ancient natives in the soapstone at Trackrock Archeological Area, just east of Blairsville. Lake Nottely is a TVA reservoir that is a local recreational resource. The Appalachian Trail in Georgia has elevations that vary from about 2,500 to 4,500 feet (1,400 m) with many steep climbs and extends, some 75 miles through the Chattahoochee National Forest. Butternut Creek Golf Course is an 18-hole mountainside public golf course located within the city limits. Encompassing nearly two-thirds of the county, the Chattahoochee National Forest has winding trails that lead visitors through scenic mountains, rushing rivers, and cascading waterfalls. This is where you can step back in time with nature and walk where the Cherokee Indians once lived. Brasstown Bald is the highest mountain peak in Georgia. It has a park with a picnic area and a small observation tower near the peak, with a movie chronicling the change of seasons and the impact of pollution on the mountain. The peak may be reached by bus or by walking from a point halfway to the top, beyond which private vehicles are not allowed. With every season in Blairsville-Union County, there are plenty of new things to see and do! Explore an amazing archaeological area or a modern-day corn maze. Hike or ride horses on tons of trails, some which lead to fabulous waterfalls. Touch, see and hear about our county’s history in the halls of our historic courthouse, between the walls of the Walisi Yi Center, or on the rocks within the Chattahoochee National Forest. Whether you’re driving a bucket of balls, pitching tents under the stars, or paddling on the waterways, you’ll find many reasons to love living each season in Blairsville-Union County. Antique stores display the work of many well-known painters, potters and sculptors, along with a colorful array of Appalachian folk art. The North Georgia Mountains is the place where serious antique shoppers can spend hours or days browsing through a growing number of shops and antique malls. Streets are dotted with unique specialty shops, galleries and eateries from one end to the other. You can furnish a mountain cabin from top to bottom with period antiques, mountain furnishings and handmade twig furniture in the blink of an eye. Beautiful Lake Chatuge wraps its 132 miles of shoreline around the mountains and valleys of these pristine communities. There is something quite remarkable about enjoying the waterway while riding on a water vehicle. If you haven’t brought your own, you can rent a myriad of water transportation options. Wild rainbow, brown and brook trout are the stars on the wild trout waters of the southern Appalachian Mountains in Georgia, North Carolina and Tennessee. You can count on the area providing you one of the most rewarding fly-fishing experiences, plus the scenic remote trout waters of the Great Smoky Mountains National Park. A few of the more popular fishing spots are Noontootla Creek, Hazel Creek, Eagle Creek, Coopers Creek, Slickrock Creek and Snowbird Creek. The Georgia Mountain Fairgrounds plays host to several popular annual events including the Georgia Mountain Fair, the Georgia Mountain Bluegrass Festival, the Rhododendron Festival, the Hiawassee Festival of Arts, the Superstar Concert Series, the Georgia Mountain Fall Festival and Georgia’s Official State Fiddler’s Convention. The Georgia Mountain Fairgrounds are located along the shores of beautiful Lake Chatuge and offer beautiful year-round camping facilities. Come share a new adventure in golf. 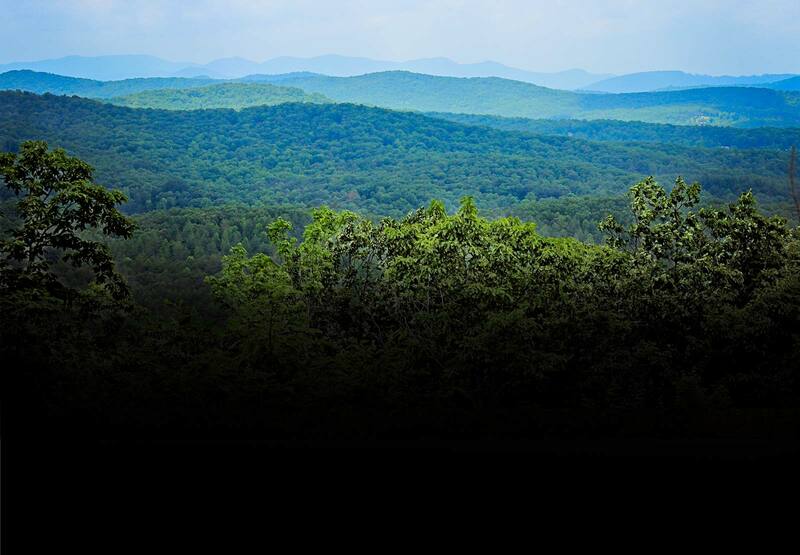 Nestled in the foothills of Blairsville comes a golf experience like no other. Old Union, designed by world renowned architect Denis Griffiths, is a 7,667 yard masterpiece, offering shot makers of all abilities, the chance to play a golf course with a true Scottish feel. The Towns/Union County area of the North Georgia Mountains is a hiker’s paradise. There are many hiking opportunities, with difficulty levels ranging from easy to very strenuous – something for everyone! The Appalachian Trail, which stretches from Springer Mountain in Georgia to Mt. Katahdin in Maine, runs through a portion of Towns and Union Counties. With so many trails, each season you’ll discover something new as you hike throughout Blairsville and Union County. The famous Appalachian Trail winds 80 miles through the most rugged areas of the Chattahoochee National Forest and is accessible at several points within Union County. Vogel State Park also features 17 miles of hiking trails. Horseback riding is one of the favorite recreational activities in these mountains and valleys. With thousands of acres of woods, streams, valleys and meadows to traverse, no matter what your age, there is something very powerful about experiencing the beauty of these mountains from the viewpoint of the equine beneath you. You won’t miss a good meal in Blairsville and Union County, and you won’t go home hungry, either! From good ol’ Southern cooking served family-style, to exquisitely-presented plates served on white tablecloths, you’ll be amazed at the variety and quantity of places in Union County that can satisfy the palate, from the simple to the sublime. Each season, there’s a new dining experience you’ll want to try in Blairsville and Union County. In addition to locally-owned establishments that each have their own unique ambiance, there are several national chain restaurants that you’ll recognize as you travel around the county or North Georgia Mountains. When we’re children we seek wonderful, out of the way, secret and mysterious places to play, we traverse paths and follow creeks hoping to come upon a place that roars with the sound of cascading water. It is never too late to delight in such fancy and it is one of the reasons that the waterfalls of this region are one of the most desirable attractions. Only a few of the waterfalls are visible from the road or parking lots. Most waterfalls are easily reached, requiring varying lengths of walks and hikes. Walasi Yi Center. Immerse yourself in history at this historical stone structure built in 1937 and located in the Blood Mountain Archeological area. It is the only place where the 2,175-mile-long Appalachian Trail passes through a man-made structure. It is currently also the first mail-drop available to northbound hikers that does not require one to leave the trail.